A few weeks ago I was contemplating clothes swapping, prompted by an online discussion with Zoë Morrison of Eco Thrifty Living. In her efforts to live an environmentally kinder life, Zoë (aka @ecothrifty) strongly advocates not buying any new clothes and is messianic about clothes swapping. In my mind, swapping is one of the many tools we can use to reduce our environmental impact but I prefer not to. In an interesting Twitter exchange with Zoë, I distilled the key reasons why swapping is not my favoured approach. Swapping is a handy way of keeping your wardrobe stocked if you like changing your style and look regularly, if you fancy having fun with different trends, if your body shape changes dramatically (e.g. due to pregnancy) or, of course, if you have growing children. None of those, however, apply to me. I know what my look is and it’s pretty classic. Well-cut skirts and dresses, tops and cardigans and all in a colour pallet that suits me. It may sound dull, but it works, particularly when living with rationing. Constraints, even self-imposed ones, quickly teach us to focus on staples! I use the bulk of my allowance on clothes I will wear regularly. This is nothing new. It’s how people have clothed themselves for centuries. There is room for the occasional frivolity, a new scarf or an unusually colourful top, but not for items I’ll only wear a handful of times. Consequently, three years into my experiment I have a modest wardrobe stocked with items that I have carefully selected or made, that I really like and that work well together. Why, then, would I want to swap them? The other key to making rationing work is quality! I have always been a stickler for quality clothes. Not expensive clothes or labels, but garments that use good fabric, are well-cut and well-made. Unfortunately, such clothes are hard to find these days. In many ways I struggle to spend my annual coupon allowance, not because I don’t want or need to re-stock but because few items meet all three criteria. I’m aware this may make me sound precious but the reality is that the quality of clothes has declined in in my lifetime, especially since 2000. When I look for a new skirt or top, I want an item that will become an ‘old friend’, not something that will perish within a season or two. So I take great care to find pieces that will last for years, and yes, sometimes I have to resort to making my own. Having gone to such care, why would I swap a carefully sourced item for one that’s likely to be of lesser quality? Thirdly, I wear my clothes to threads. All my clothes fit somewhere on my clothes ladder. My 5-year old black corduroy skirt is still on the top rung. Although faded it is smart enough for ‘public’ consumption, e.g. for meetings, concerts, dinner with friends… My denim skirt, by contrast, is on the threshold of ‘domestic’ consumption and ‘muck’ clothes. I wear it around the house or when I’m out and about doing chores and when working in the garden. Actually, it is probably only fit for gardening and cleaning days but it is so comfortable that I can’t quite banish it fully to the ‘muck’ tier. My old cherry cashmere cardigan is darned and patched to within an inch of its life so is definitely in a ‘muck’ garment. 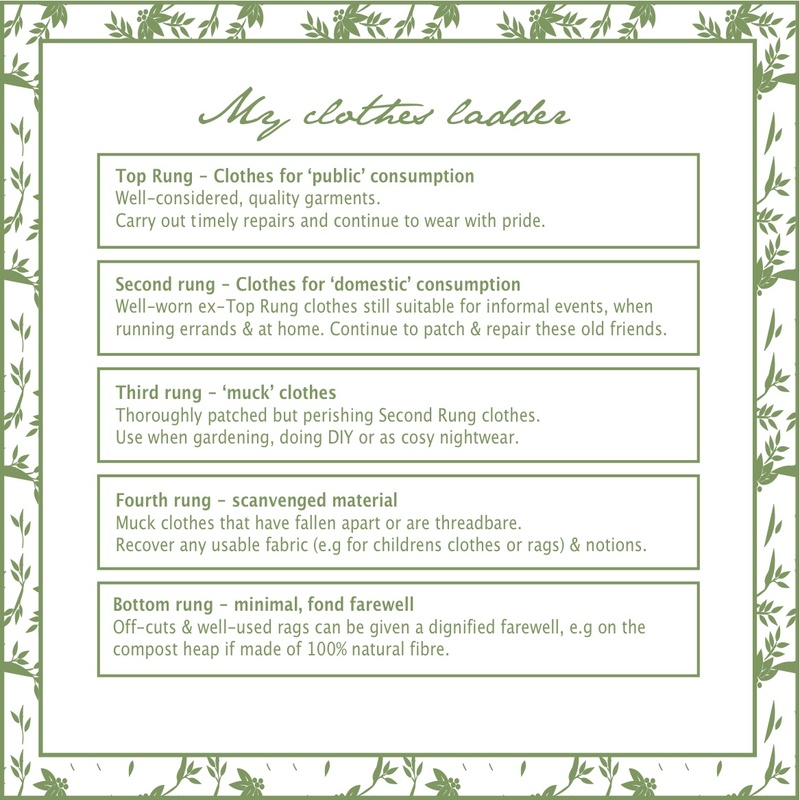 It is too cosy and warm to relinquish though so it belongs to the patched nightwear section of ‘muck’ clothes. By the time my clothes have fallen off the ‘muck clothes’ run, they are only fit for rags and the compost heap. At this stage I am prepared to say goodbye to them but they are too threadbare and patched to take to a clothes swap or charity shop. Despite our different approaches, the key thing to emerge from my online discussion with Zoë is that, in navigating ethical and environmental dilemmas, we’re both having a good time while “consuming” a whole lot less! In my last update I mentioned I still had 9.5 coupons left, and a list of things I needed to restock. I managed to find a skirt (7 coupons) that ticked my three criteria and replaces the denim skirt, which is close to ‘muck clothes’ status. I also knitted myself a hap, aka a shawl, accounting for a further two coupons. This year, I used the sales to restock my tops with one T-shirt (5 coupons). I also have a few small knitting projects on the needles using left-over stock: a hat and a pair of socks. Rationing has really made me enjoy knitting small items. As some knitwear designers overestimate the amount of yarn needed for a project, I still have a good stash of odd skeins. I’m not the biggest fan of fair isle knitting so I prefer to use these leftovers on little garments that ring the changes (whilst keeping me warm) rather than one multi-coloured sweater. This is remarkably similar to how I approach things! I don’t really have a second rung — which I think is a problem actually. I would like to have around the house/errand things. My stuff is usually wear to work or messy get dirt and paint on them things. I’ll have to try and cultivate this! I find myself bringing more things to a swap than taking, which is good for me. I have a hierarchy in terms of how I rehome items I already own if they’re not a good fit for me (which I sometimes find out only after a while – or after weight gain – or after I realize they’ve sat untouched in my closet for 2 years) and swaps are #2 in my list of places to route items to match them to people who will use them. Resale, swaps, thrift store/textile recycling.